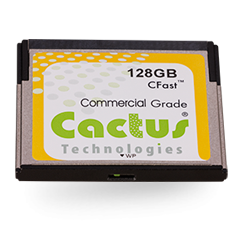 NUREMBURG, GERMANY, February 28, 2018	(Newswire.com) - Cactus Technologies today introduced two new CFast products with physical write protect switches in MLC & pSLC versions. The new 240S Series Commercial Grade CFast Write Protect using MLC NAND and 245S Series OEM Grade CFast Write Protect complement our existing 900S Series Industrial Grade CFast Write Protect and are available for customers not requiring the extremely high write endurance cycles. 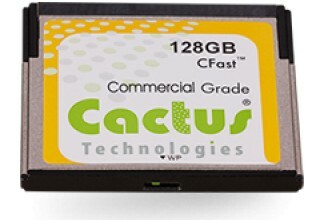 The Cactus Technologies 240S CFast Write Protect is based on MLC NAND and comes in capacities from 8GB to 128GB. 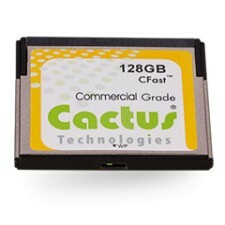 Extended -40C to 85C versions are also available from 16GB to 128GB. 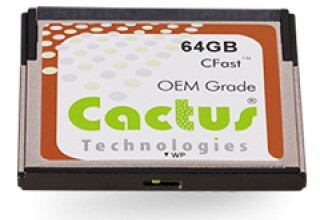 The Cactus Technologies 245S CFast Write Protect is based on pSLC NAND and comes in capacities from 4GB to 64GB. Extended -40C to 85C versions are also available from 8GB to 64GB. 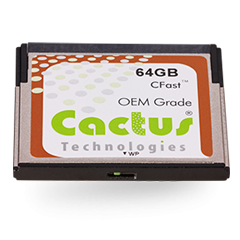 As with all Cactus products, both of these new CFast Write Protect products have Locked BOM Control, High Performance, Rugged Construction and advanced Wear Leveling, ECC and Defect Management.